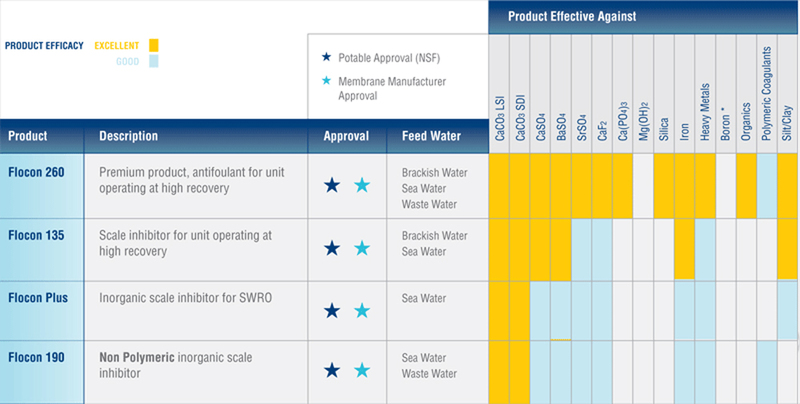 Flocon® Antiscalant water additives, used as pretreatment for Reverse Osmosis systems, are highly effective in preventing membrane scaling. Flocon 190 is a solution of an organic phosphonate. Flocon 190 is highly effective in controlling the deposition of inorganic scale forming salts on membrane surfaces. Prolonged membrane life by prevention of scale build-up. More cost effective and space efficient than water softeners. No regeneration is required: no water being flushed to drain; no down time.